The first meeting to discuss transportation and land use in the Newburgh area will be held Wednesday, May 27th at the Newburgh Recreation Center, 401 Washington Street. Why should this interest you? Because redevelopment in and around the city of Newburgh will be discussed. The Broadway corridor, the SUNY Orange Campus, and Robinson Ave (9W) are areas in consideration for redevelopment. More information is available at the Orange County Department of Transportation and Transit here. Colonial Terraces is inside the city of Newburgh, but is it’s own little community. Here is a map for those interested. 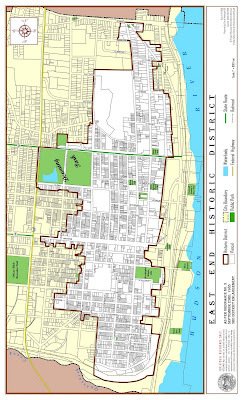 For those of you that are interested in the City of Newburgh, but can’t quite capture the actual size of this city, here is a map of the historic district. This map was made in 1985, so there might be some slight modifications to this map. I think what is considered the historic district might even have expanded since 1985. But what is encircled is just the historic district. That is not to say that the city’s lines do not cross the boundary (see the legend). The horizontal view is the original view, but it’s confusing because North is West, and if you are unfamiliar with NY geography, you will think the Hudson River runs East-West, when it really runs North-South. So I rotated it so that you can get a better feel of what it really looks like. To think that the city was even LARGER. Back in the 70’s all of Water and Front Streets were razed during an “Urban Removal” er “Renewal” project. Many many other buildings were razed as well. All of the buildings that you see in my “Newburgh Restoration” header on the water front have all been demolished. Slowly the city will be getting smaller as more buildings are torn down. Newburgh has the potential a to be a great city-it has all the ingredients necessary. It just needs more preservation minded citizens. Hopefully one day it will happen.